Are there really such things as Magical Realms? On the other side of your computer screen? For teenager Ian Wilson, his normal life will never be the same. When a portal magically appears on his computer screen he follows his father through to a deceptively beautiful Realm, where horses run free, the wind sings prophetic melodies, and their computer avatars come to life.Then the two are separated and Ian is abducted by a tribe of dragon worshipers. He must find his courage as he struggles to obtain his freedom. Will he find his escape? Can he find his father and discover the purpose for his magical journey or will his adventure end tragically? 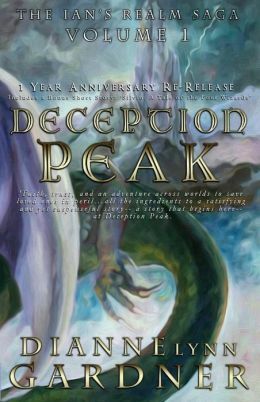 If you enjoy wizards, magic, dragons, an adventure, fantasy and traveling to a different world, you will enjoy Deception Peak! Includes ‘Silvio: A Tale of the Four Wizards’. Being a teen is tough – especially when you’re caught up in a world you know nothing about while your dad’s lost somewhere. The challenge of school and every day life will never be the same. I’ve been excited to read Ian’s story since I first heard about his characters and “Deception Peak” did not disappoint. The story is adventurous and a pleasure to read, painting very real images with both words and beautiful visual art created by the author. I absolutely adore stories that pull you into a character and rumble around in their head with their highs and woes, like the internal struggles and growth Ian experiences. The story has consistent movement with plenty of action the reader gets to experience via Ian. I enjoyed the contemporary elements and the ties to the real world throughout, making sure it’s never truly astray. Particularly touching is the father-son aspect which draws me in even more because it reminds me of my own family, where my father and brother share an interest in technology and working on projects together. It’s like being home. The kindness shown by Amleth and others caught my heart, providing a lovely balance to other characters who aren’t as kind. I’m also a sucker for the varying emotions involved in the story, making the characters real like they should be in any great adventure. Sometimes the world is up and sometimes it’s down, but Ian keeps going. He has pluck and courage, yet there is certainly a lot of potential for him to grow! He faces several hefty lessons but his heart is in the right place, all of which is valuable to our youth who are reading and learning about the world and who they can be. I look forward to see how Ian progresses. Want to read Deception Peak? Purchase it in print from Amazon or get it on Kindle. There’s even an audio version. Or, you can also purchase it in print from Barnes & Noble. Stay tuned for more about Dianne this week with her exciting re-release of Dragon Shield, the second installment in the Ian’s Realm Saga! On Friday, May 9th, I’ll be posting an interview with the author and more. Categories: Novels, Reviews, YA Fantasy, Young Adult Literature | Tags: Dianne Lynn Gardner, Fantasy, Ian's Realm Saga, novel, Review, series, YA literature, young adult | Permalink. Thanks so much for posting this, Regina!! !